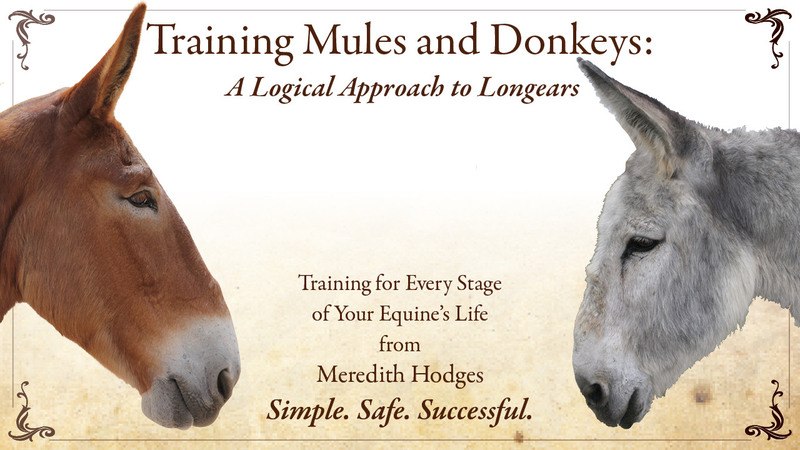 Training for every stage of your equine's life from Meredith Hodges. Each of these episodes were taken from Meredith's original Training Mules and Donkeys DVD series. Episode 01. Loafing Shed, Box Stall, Tie Stall, Grain Box, Water Source, Bedding, Manure Disposal, Dangerous Confinement, Hot wires, Vinyl and Pipe Fencing, Healthy Equine, Feed, Supplements, Trace Mineral Salt Block, Corn Oil, Routine Times, Water, Training and Exercise, Walking, Trotting, Turns, Vaccinations, Worming, Cleanliness, Pasture Rotation, Symptoms and Simple Treatments, First Aid Kit, Infectious Diseases, Immunization, Tools, Hoof Care, order of Grooming, Clipping, Bathing, Coats, Vacuuming. Available with English captions. Episode 03. General Concepts, Grooming, Lead Shank, Showing, Show Patterns, Halter vs. Showmanship, Sportsmanship. Available with English captions. Episode 04. Work Station, Preventing Bad Habits, Ground Training, Training Aids, Sacking Out, Saddling, Routine, Obstacles. Available with English captions. Episode 5. Working Space, Tack and Equipment, Lunging, Mad Jack Hanks, Elbow Pull, Lunge Line, Lunging in Open. Available with English captions. Episode 06. Different than Horses, Persuasion vs. Force, Round Pen, Arena, Flight or Freeze, Hourglass Pattern, Equipment, Maturity, Farrier, Mad Jack Hanks. Available with English captions. Episode 07. Work Station, Round Pen, Canter/Bucking, No Assistant, Hourglass, Follow the Leader. Available with English captions. Episode 08. Different than Horses, Persuasion vs. Force, Sequence, Equipment, Maturity, Techniques, Patterns, Canter, Refining Cues, USDF, Obstacle Course. Available with English captions. Episode 09. Equitation, Draw Reins, Green Equine, Patterns, Obstacles, Dressage Levels, On the Bit, Half Halt, Bending, Long Rein vs. Loose Rein. Available with English captions. Episode 10. Bending, Lateral, Riding Obstacles, Lead Changes, Trail, Showing. Available with English captions. Episode 11. Warm-up, Snaffle vs. Curb Bits, Dressage, Ground Lateral Exercises, Counter Canter, Simple Lead Changes. Available with English captions. Episode 12. Reining and Western Riding, Equipment, Circles, Speed, Sliding Stops, Backing, Rollbacks, Spins, Flying Lead Changes, Patterns. Available with English captions. Episode 13. Tack, Clothing, Equitation, Farrier, Clipping, Body Positions, Types of Jumps, Making Standards, Ground Poles, Stretching and Warm-up. Available with English captions. Episode 14. Housing, Feed, Nutrition, Peak Condition, Routine Health Care, Grooming. Available with English captions. Episode 15. Differences of Longears, Understanding the Mule, Showmanship for Foals, Advanced Showmanship, Patterns. Available with English captions. Episode 16. Body Clipping, Braiding, Trailer Loading, At the Show, Bishop Mule Days. Available with English captions. Episode 17. Understanding the Donkey, Imprinting, Tying, Leading, Obstacles, Trailer Loading, Showmanship. Available with English captions. Episode 18. Measuring for Athletic Potential, Assessing Trainability, Donkey Jack, Behavior, Characteristics. Available with English captions. Episode 19. Round Pen Training, Moving Away from Pressure, Turns on Forehand and Haunches, Lunging, Mounting. Available with English captions. Episode 20. Riding vs. Driving, Make Sure You're Both Ready, Fitting Harness, Lunging in Harness, Ground Driving, Carts and Carriages. Available with English captions. Episode 21. Sacking Out, Ground Driving with PVC Poles, Pulling a Drag, Travois, Driving a Team, Working in Harness, Pulling Competitions. Available with English captions. Episode 22. Hitching to the Cart, Ground Driving Cart, First Drive, Unhitching, Reinsmanship, Pleasure Driving, Obstacle Driving. Available with English captions. Episode 24. Canter Leads, Changing Leads Straight Line, Lateral Moves, Proper Frame, Lengthening, Jumping, Massage. Available with English captions. Episode 25. Equipment and Showing, Safety, Riding Positions, Types of Jumps, Gymnastics, Stadium Jumping, Coursework, At the Show. Available with English captions. Episode 26. Safety, Combined Training, Levels, Protective Gear, Rating Speed, Types of Jumps, Warm-up, Walking the Course. Available with English captions. Episode 27. Meredith Hodges and Richard Shrake discuss the advantages of resistance-free training when dealing with equines. Available with English captions. Episode 28. Meredith Hodges and Richard Shrake discuss realistic ways of evaluating and selecting your equine to suit your purpose. Available with English captions. Episode 29. Meredith Hodges and Joanne Lang discuss the benefits of equine massage and how to get the best from your equine. With equine massage and stretch demonstration. Available with English captions. Episode 30. Subtle components of good training that will influence the success of your training program. Available with English captions. Episode 31. Importance of setting up the environment and considering safety rules in a way that promotes success. Available with English captions.